How to reset your passwords? » Client Id. » PAN No. » Date of Birth » Mobile no. 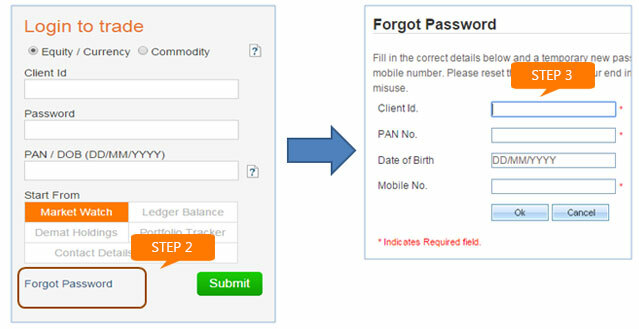 You will receive your password via SMS on your registered mobile number. Note: Please note that the password is case sensitive & will expire in 72 hours. Also, once you change the password, it expires after every 90 days. So, kindly change the password as and when you receive the message for same. Where to check your DP Holdings? 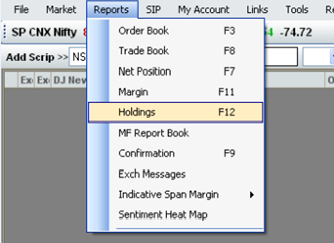 Select Holdings tab which is towards the center bottom of the screen. You can view all your holdings under one tab. 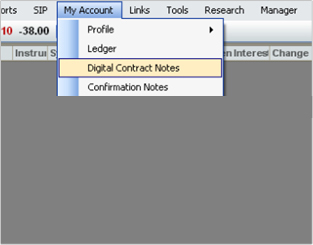 Where to view your contract note? Where to view your RM details? Select Equity/Commodity → RM & Branch Details to view your RM Name, RM Contact Number, RM Email Address, Branch Address & Branch Contact Number.